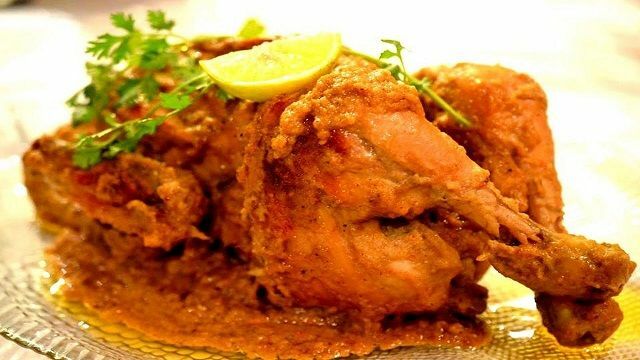 Murgh Musallam whole chicken recipe. Murg in Urdu means chicken and Musallam stand for whole or entire. Thus murgh musallam is a whole chicken cooked in spices. Murgh Musallam is a lavish dish in which a whole chicken is marinated, stuffed with eggs, prepared with spices like saffron, cinnamon, cloves, poppy seeds, cardamom and chili. The first documented history of this dish refers it as a favored dish served at Sultanat of Delhi. A grand dinner hosted by Sultan Muhammad Ibn Tughlaq (1325-1651 AD) for a Qazi (a wise person who settles conflicts and disputes) from a foreign land. In this dinner, there was a dish, which featured a roasted fowl served on a bed of ghee-cooked rice. Murgh musallam is also one of the most famous dishes of the Lahori cuisine. Lahore earlier a part of India and now in Pakistan gave birth to this type of cooking and it roots go deep into imperial kitchen of the Mughal Empire. This dish is also a center piece of Avadhi lavishness. Awadh invented the dum style of cooking or the art of cooking over a slow fire. Avadhi – is a cuisine of Lucknow (capital of Uttar Pradesh – a northern state of India). There are several versions of Murgh Musallam in India at present. While some families and chefs follow the Mughal way of stuffing the chicken with minced meat and eggs, Awadhi cuisine enthusiasts go for a filling of nuts and mewa,”. 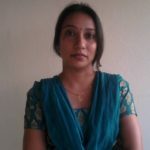 Today I will make a fusion of to simplify the cooking of murg musallam at come. In this recipe we will not roast the chicken like that of mugal style rather we will fry it. Further we will fill up the murg musallam with minced meat and eggs following the mugal style of cooking. Then we will cook it over dum like Awadhi style of cooking. For serving it in royal style we will prepare ghee-cooked rice with nuts like that of Sultan Muhammad Ibn Tughlaq’s grand dinner. Murgh Musallam is a special chicken dish in India and Pakistan , Murgh Musallam means ‘whole chicken’, therefore it stands to reason that the recipe calls for a full chicken to be marinade in a variety of spices and then cooked. 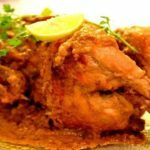 Learn the way to create a unique Whole Chicken recipe, murg musallam recipe. Create this delicious, chicken recipe easily at your home. Remove the internal organs from the whole chicken. Wash the chicken from outside and clean the internal cavity of whole chicken thoroughly with water. Make deep incisions with a sharp knife on the chicken breast, legs and thighs. This will help in even cooking of chicken from all the sides. Take a large bowl and well mix 1 tablespoon lemon juice and 1 teaspoon salt. Now dip the chicken in this mixture and rub the mixture evenly on internal cavity and external incisions of body. Now take a small bowl and mix 1 teaspoon saffron in tablespoon kewra water. Now apply this mixture evenly on internal cavity and external incisions of body. This process adds nice aroma and beautiful color to the recipe. Now keep it for 4-5 hours in refrigerator so that the chicken absorbs the flavor of saffron and kewra water nicely. Now in a bowl take 3/4 cup whisked curd and to it add ginger paste, garlic paste, Kashmiri red chili powder, green cardamom powder, green chili paste, coriander chutney, cumin powder, coriander powder and mix well. Now rub this spice mixture on the chicken surface and cavity and marinate for at least 30-45 minutes. Heat the oil in saucepan to fry onion until translucent, then add blanch and chopped almond, chopped cashew nut, chopped pistachio and fry for a minute on high flame. Now add the spices - ginger paste, garlic paste, turmeric powder, red chili powder, cumin powder, coriander powder, green chilies and salt to taste and again fry till oil starts separating from spices. Now add 2 boiled eggs into the spices. Rotate the egg's from all the sides in the spices so that the eggs get fried from all the sides and also the color of eggs get improved. After the eggs get fried from all the sides remove the eggs from the spice mix and keep aside for later use in filling. Add tomato puree to this spice mix then minced mutton or minced chicken (as per your choice). Mix well and fry for 4-5 minutes. Then add garam masala powder and lemon juices to it mix well and cook for another 1-2 minutes. Remove it from heat because we do not need fully cooked minched meat. It will get cooked inside the chicken during slow cooking process. Take half cup water in a non-stick pan and put finely chopped onion into it and let it boil for 2-3 minutes in low flame. Now put almond in 1 cup lukewarm water for 5 minutes. After 5 minutes remove the almonds from the water and remove the skin from it. Heat a non-stick pan over low heat and roast the cashew nut, peeled almond, poppy seeds for 1-2 minutes. Now put roasted cashew nut, almond and poppy seeds in a blended jar along with boiled onions. Blend it into coarse paste. Keep it aside, we will use it during preparation of murgh musallam gravy. Now heat 1 cup oil in a deep nonstick pan over high flame. When the oil starts to smoking, gently shift the marinated whole chicken into the oil and let the chicken to stew fry till its skin gets golden brown. It takes 1-2 minutes. Rotate the chicken in oil and stew fry from all the side just till the skin of the chicken turns golden brown from all the side. Take some hot oil in a spoon from the pan and put it inside of the chicken cavity too so that the chicken gets fry from inside too. Frying chicken at this stage lets chicken to get cooked 60-70 percent. Thus helps in easy and fast cooking at home and reduces the time of slow cooking at the last state of murgh musallam preparation. Remove the fried whole chicken from oil and let it cool down a bit. Then stuff the cooked minced meat along with fried boiled eggs tightly in the cavity of the chicken. After tightly filling the cavity tie the legs of the chicken with kitchen twine. In the same oil in which we have cooked chicken earlier add half tablespoon ginger paste, half tablespoon garlic paste, sauté for a minute. Then add tomato puree, Kashmiri red chili powder, fennel seeds, coriander powder, cumin powder, green cardamom powder and salt to taste mix well and fry the spices on high flame till oil separates. Now add left over marinating spices with previously prepared dry fruit paste and again fry till the mix starts boiling and oil starts separating again. Now add garam masala powder and whisked curd again mix well and cook over high flame. Now add tandoori masala and sprinkle rusted fenugreek leaves crushed between palms again mix well and cook for 1-2 minutes. Further add fresh cream and khoya then mix well again cook for a minute. Then put the fried stuffed chicken with breast portion of chicken touching the base of pan. Since the breast part has the most of the flesh in it thus it takes time to cook. Now pour some gravy on the stuffed chicken top and let it cook covered on low flame for around 20 minutes.Open the cover after every 4-5 minutes - lift the chicken little bit and rotate the chicken in the gravy and also pour some gravy over the chicken. This process helps in even cooking of chicken from all the sides. After 20 minutes turn the chicken upside down. Again pour some gravy over the chicken top and cook covered for 10 minutes rotating the chicken after 4-5 minutes in between. Switch off the gas. In a plate put the chicken and pour the gravy over it. Garnish it with fresh coriander leaf and lemon piece. Your murgh musallam is ready to serve hot. Serve hot with Kaju Rice. Looks delicious Punam!! Love all the spices; yumm! I love chicken, but I have never had it cooked this way, it sounds delicious! Murgh Musallam looks super delicious, Punam…..I have one question…..Is it mandatory to stuff the chicken with rice ??? Jayeeta ji it is optional, you can also cook it without rice.